I saw the newest Star Wars movie last week and it brought back memories that stretch back almost four decades. Watching Harrison Ford and Carrie Fisher on the screen reminded me of my age, though, once I learned how much Ford made for being in this episode, I understood the movie's story line much better. 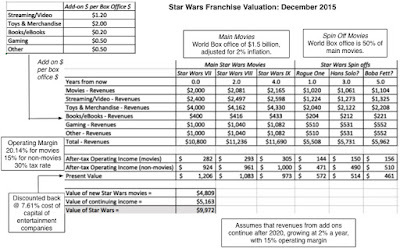 As I came out of the theater, though, I decided that it would be fun to update a valuation I did of the Star Wars franchise in 2012, when Disney acquired the rights from Lucas Films. If you are one of the few people on the face of the earth that has not followed the Star Wars story, it began in 1977 when George Lucas produced the first Star Wars movie, the fourth episode in what he saw as a six-episode series. That movie made history and remains one of the highest grossing movies of all time. It was followed in 1980 by the fifth episode, The Empire Strikes Back (my favorite), and in 1983 with the sixth in the series, The Return of the Jedi. Those first three movies created an entire generation of Star Wars fans, who then had to wait 16 years for the first in the series, The Phantom Menace (my pick for the worst of the series), which was followed by Attack of the Clones in 2002 and Revenge of the Sith in 2005. The six movies represent one of the most valuable movie franchises of all time, generating billions of dollars in box office receipts, with the appeal spreading globally. The movies are shown in chronological order and the box receipts on the first three movies include the collections from their re-release in theaters in the 1990s. The Add-Ons - Bigger than the Movies? VHS/DVD/Rentals: The additional revenue from this stream reflects as much the hold that Star Wars has had on our collective imaginations, as it does the changing of technologies for home video watching over the decades. Starting with video tapes (VHS) sales and rentals in the 1970s, morphing into DVD sales in the last decade and continuing into streaming in today's environment, this add-on has generated $7.7 billion (unadjusted for inflation) in revenues. Toys and Merchandise: This is the crown jewel of the franchise, as toy and merchandise sales have outstripped all other sources of revenue. The revenues from action figures sold by Kenner (1978-1985) and Hasbro (1995-2011) amounted to almost $10 billion (unadjusted for inflation) and adding in other merchandise, the collective revenues from toys and merchandise over the history of the franchise is in excess of $12 billion. Gaming: As with the video rentals, the Star Wars games track shifting technologies, starting with an unlicensed game for the Apple II on a cassette tape, followed by table-top game by Kenner and games for the Atari. Starting in 1992, the games shifted away from the films to the expanded Star Wars universe, first with the X-wing computer games and later with Dark Forces, a shooter game. In 2013, Disney revealed that Electronic Arts would retain the rights to produce games for PCs and consoles, while Disney would retain the rights for other platforms. The collective revenues from all of these games between 1977 and 2015 is $3.4 billion. Books: There have been almost 360 books, with 76 authors, in the Star Wars series and total sales have amounted to more than $1.8 billion. The staying power of the franchise is backed up by the fact that the first books were in print in 1978 and that there have been at least ten Star Wars novels a year, every year from 1991 to 2014. TV Series/Other: Given its success on so many dimensions, it is surprising that the Star Wars franchise has not spawned a higher profile TV series. The longest lived TV series, Clone Wars, has had seven seasons and a second one, Star War Rebels, produced by Disney, has had two seasons. There have been periodic rumors about other TV series in the works, with the latest one suggesting that Netflix is planning three live-action series. 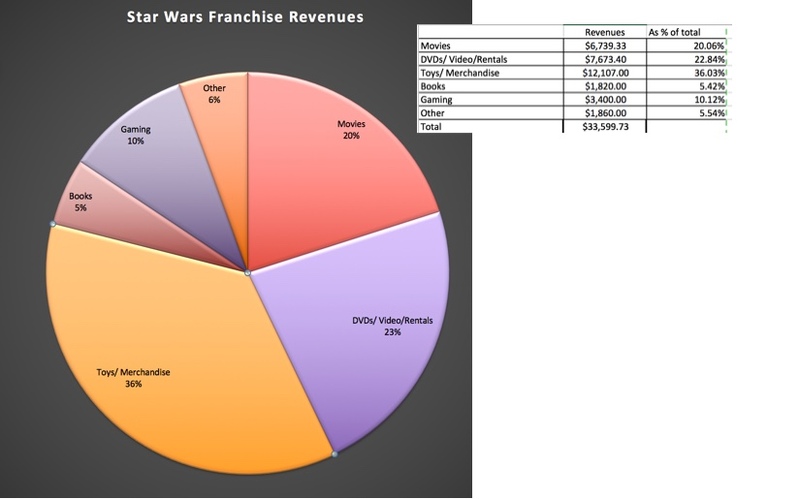 In effect, for every dollar that Star Wars has made at the box office, it has generated four dollars in revenues from other sources. That number is a conservative estimate, since there have been undoubtedly others who have profited from the franchise unofficially (and illegally). In 2012, Disney acquired the Star Wars franchise for $4 billion, from George Lucas, with plans to produce three more Star Wars movies. At the time of the acquisition, I argued that it was a fair price, given Disney's history with developing, maintaining and merchandising franchises, but had to draw on the potential for synergy to justify the number. With the release of Star Wars: The Force Awakens just about ten days ago, Disney seems to be more than delivering on its promise, as the movie has broken box office records and is on its way to delivering a global box office of $2 billion or more. To the extent that this movie, like its predecessors, will generate add-on revenues, there will be substantially more money to be made over the next few years. The next two movies are scheduled for 2017 and 2019, and there will be three spin offs in the intermediate years, with less ambitious budgets. After 2020, Disney's plans are not specific, but if the appetite remains, there will be undoubtedly more movies in the pipeline. More importantly, the movies will not only create a new base of younger fans but augment the sales of merchandise, toys and games in the coming decade. The revenues that would have come from DVDs and video rentals will be replaced with streaming revenues and there will undoubtedly be games and apps directed at smartphones, devices and gaming systems. 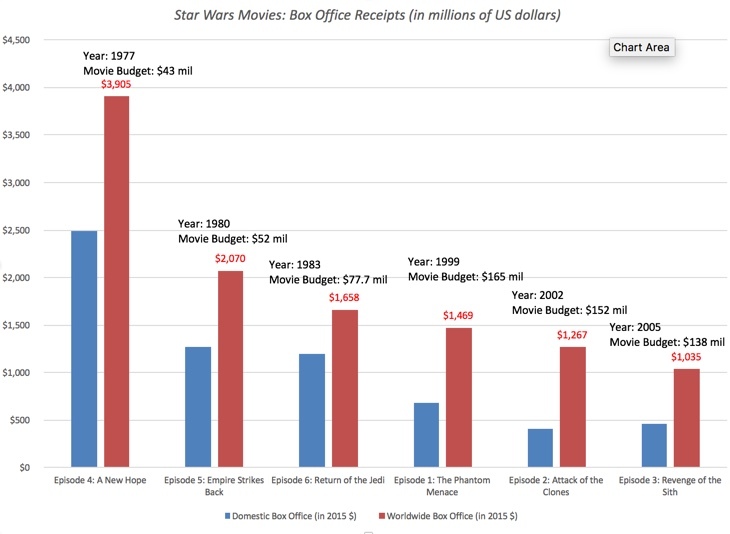 To value the franchise, I started with my estimates of worldwide box office receipts for Star Wars: The Force Awakens and the subsequent movies in the series. Though, the first two weekends have blown away expectations (with the movie making $1 billion), I will estimate $2 billion in revenues, for each of the three main movies, and half those proceeds for the spin offs, with an inflation adjustment of 2%. Streaming: As viewers increasingly turn to watching streamed movies from services (Netflix, Amazon Prime) on their televisions and devices, the revenues from streaming are quickly catching up with box office receipts for movies, and by 2017, the total revenues from streaming are expected to exceed box office revenues. 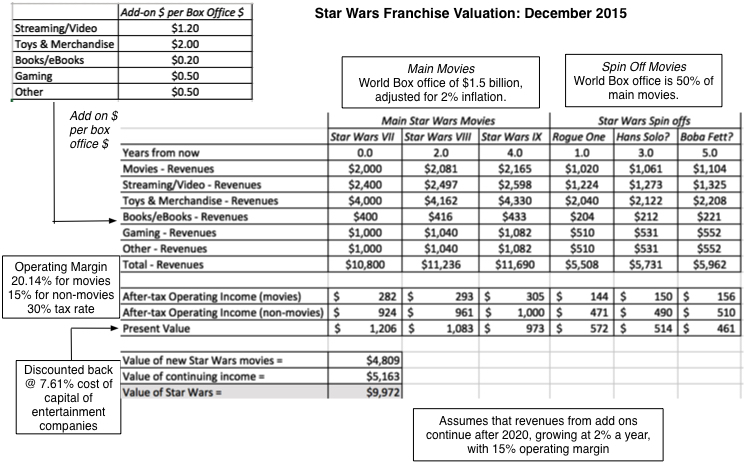 I will assume that each dollar in box office revenues from the new Star Wars movies will generate $1.20 in additional revenue in streaming, slightly higher than historical numbers (1.14). 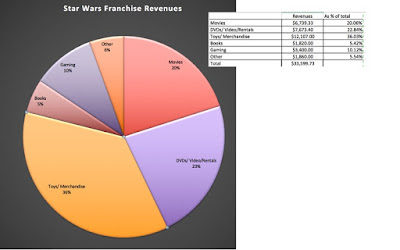 Toys/Merchandise: The Star Wars movies have historically generated $1.80 in revenues from toys/merchandise for every dollar in box office revenues. Given Disney's prowess at merchandising, I would not be surprised to see this number go up, and I will assume that each dollar at the box office will translate into two dollars in merchandising revenues, a little higher than the historical value of $1.80 per box office dollar. Keep in mind that this franchise is a merchandisers' dream, with an almost endless potential for new opportunities in the Expanded Universe. Books and eBooks: This is the stream that is perhaps most at risk, and I will assume that while a way will be found to adapt the publishing stream to changing tastes in reading, the revenues from this books/e-books will drop to $0.20 per box office dollar (from $0.27, the historical number). Gaming: In keeping with the history of Star War games, I am convinced that that games will be adapted not only to gaming platforms (Xbox, Playstation and Nintendo) but also to smartphones and tablets. I will leave the gaming revenues at $0.50 per dollar in box office receipts. TV Shows/Other: This is the one add-on where I will assume a significant improvement over historical numbers, as Disney, Netflix and others find ways to adapt the franchise to television viewers. 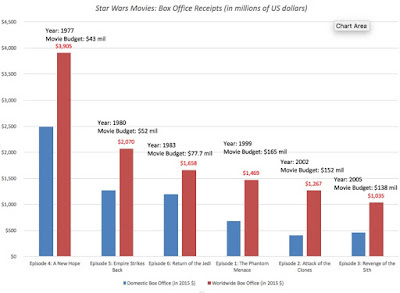 I will assume that the revenues from TV shows will increase to $0.50 per dollar in box office receipts. Not only does that make Disney's $4 billion investment three years ago a very good one, but any synergies that Disney can gain in its other businesses (like this one) will create more upside. As always, you are welcome to make your own assumptions and revalue the franchise, using this spreadsheet. An Acquisition Model that works? I am not a fan of acquisition-driven growth, primarily because the process so often leads to over paying for growth, but Disney may have found an acquisition model (albeit a limited one) that works with its Star Wars and Marvel acquisitions. In both cases, the company bought established movie franchises and has used its merchandising machine to generate value. Those results have already borne fruit with Marvel, especially with the Avenger movies, and we may be be seeing the beginnings of the Star Wars dividends this week. During the week, while I was in the city (New York), I saw at least three Stormtroopers and a Darth Vader on Times Square and every store that I went into had something related to Star Wars, on sale. If you are a Star Wars purist, appalled by the shameless merchandising of the movie, I am afraid that you ain't seen nothing yet. If you are a Star Wars collector, and think that you have the entire collection already (for you or your kids), here is something for you to ponder. If you are a Disney stockholder like me, may the force be with you! Much of what we learn and practice as investors represent models and methods developed in a different age, one where the market was composed of consumer product, infrastructure and manufacturing companies. While those lessons may have been good ones for old economy markets, I will argue in this post that they can provide misleading signals with short corporate life-cycles, an affliction common among, but not unique to, tech companies. Lest this be construed as an attack on a specific group of investors, I will spread my critique across investor classes, starting with value investors, then moving on to growth investors and market timers and then turning it on intrinsic valuation practitioners (which is where I count myself). If you are a value investor, you may have been told that everything you need to know about valuation is in Ben Graham's Security Analysis. I will make a confession. I love Ben Graham for his philosophy and intellect, but I think that using the techniques suggested in it to value tech companies is akin to using a hammer to do surgery. It is not Graham's fault, since he wrote the book at a time when the corporate world was populated with railroads, utilities and manufacturing companies and much of his advice was directed at coaxing investors who were more interested in buying bonds, to consider stocks as an alternative. In fact, in the Graham world, a good stock looks like a perpetual bond, with ever-growing coupons. So, at the risk of arousing the ire of value purists, here is my list of old value investing chestnuts that need to be roasted on the tech fire. 1. Don't trust earnings multiples: There are some pricing metrics that are singularly inappropriate for use with tech companies, and at the top of the list is price earnings (PE) ratios. 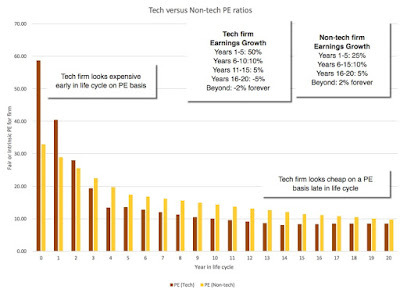 Early in the life cycle, when growth is explosively high and R&D expenses are rising, the PE ratios for tech companies will be high, as markets price in future earnings, and tech companies will almost always look expensive, even if they are fairly priced. 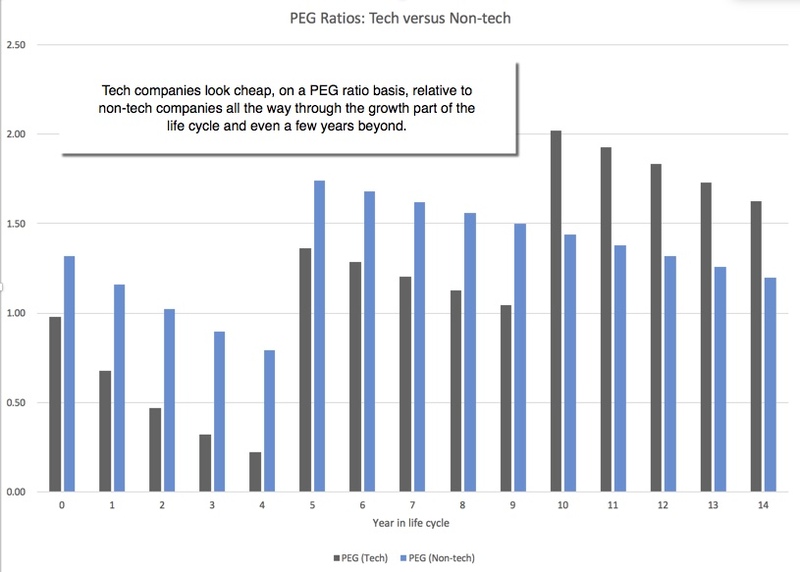 Later in the life cycle, when growth is not just low but often negative and R&D expenses are falling, the PE ratios for tech companies will be low, and tech companies will look cheap, even when they are not. To illustrate this dynamic, I created two companies, both with 20-year windows and similar risk, but made one a tech company, with intense growth (50%) for the first 5 years, a short mature period of 5 years (10%) and speedy decline thereafter and the other one a non-tech company, with less intense growth (25%) for the first 5 years, a longer mature period of 10 years and a more stable afterlife. The graph below shows the fair PE ratios for these firms, as they move through their lifetimes. 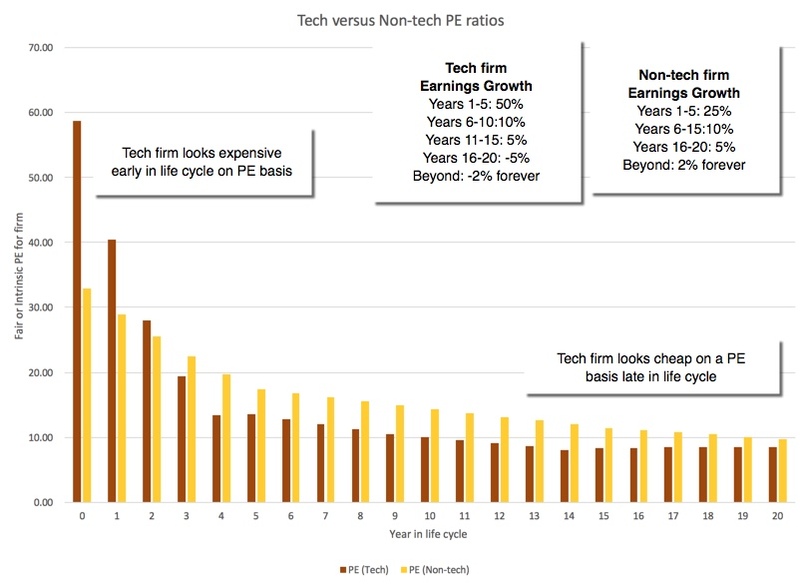 The bottom line is that tech companies look expensive on a PE ratio, when they are young, and cheap on a PE ratio basis, when they age, even if they are fairly valued. This problem is exacerbated by the accounting mistreatment of R&D, which makes young tech companies look less profitable than they truly are and old tech companies more profitable. Multiples of revenues and book value are also affected, but not to the same degree. Note that old tech companies look cheap on every earnings metric, relative to old non-tech companies. There may be a reason why companies like IBM and Microsoft keep showing up on the lists of cheapest stocks, when you run value screens. 2. Don't buy and hold "good" companies: Not all value investors subscribe to this notion, but quite a few seem to accept the idea that if you find a good company (well managed, with strong competitive advantages), you should buy the company for your portfolio and hold for the long term (perhaps forever). That is not good advice with tech companies, where today's tech superstar can become tomorrow's dog. If you buy a tech company, you should be revaluing it at frequent intervals, selling it, if the price exceeds the value significantly. 3. Don't prize dividends over stock buybacks: I have always believed that fixed dividends are a ill-suited way of returning cash on a residual claim (equity), especially because investors who receive them seem to view them as constants that should not be changed. 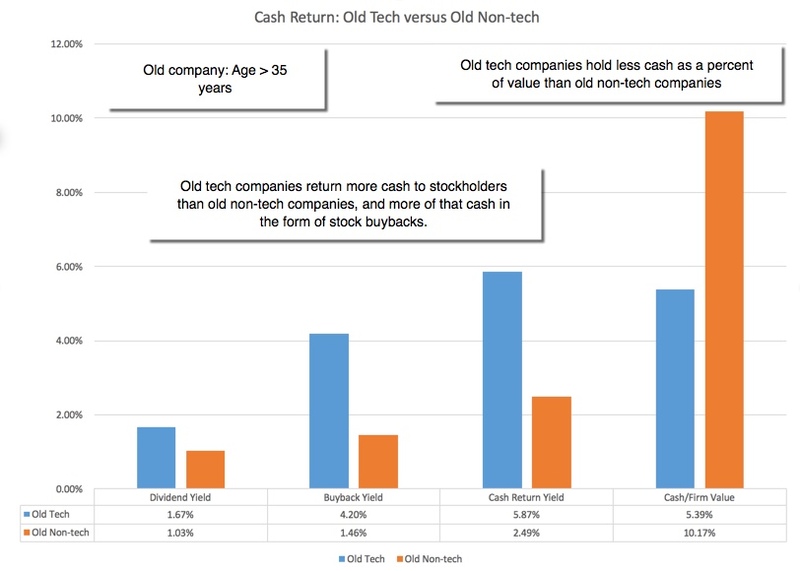 With technology companies, I would argue that stock buybacks are not only more suited to their life cycle needs, but are also more reflective of what they can afford to pay out, than large dividends. 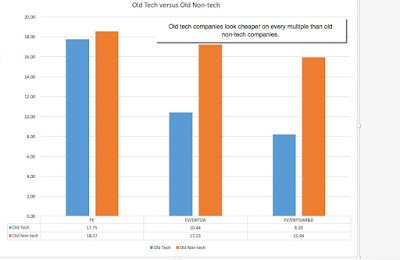 Again, I can offer partial backing for this statement by comparing cash returned by old tech companies versus old non-tech companies. 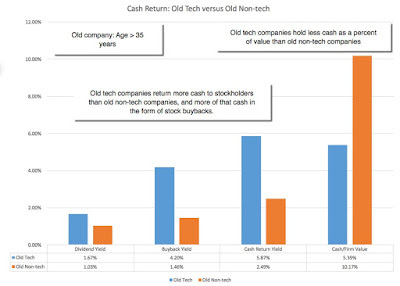 Old tech companies have, at least in the aggregate, returned far more cash to stockholders than old non-tech companies, have used buybacks more frequently and have held on to less cash wishing the companies, behavior that you would expect in the aggregate in the speeded up life cycle hypothesis, where decline is more precipitous. While growth investors don't have the long traditions that value investors do, they have their own share of dos and don'ts accumulated through time. One is, of course, the idea of buying growth at a reasonable price (GARP), a notion made popular by Peter Lynch's work at Magellan and his resultant writings. In putting that common sense notion into practice with tech companies, growth investors draw on they own share of practices based on the premises that growth is good, that it is sustainable and if bought at a reasonable price, is a winning strategy. Growth is not always good: I have long argued against the lazy notion that growth is good and that a company should therefore go for growth, at any cost. While that notion is dangerous at any company, it is particularly so at tech companies, where once the life cycle turns, growth is a value destroyer, not a value adder. Growth may not be sustainable: Growth in the past has never been a great indicator of future growth across companies, but it is a particularly misplaced notion with tech companies where growth rates can change over night. 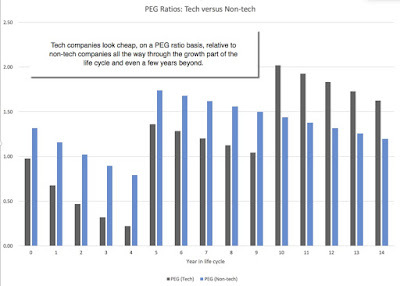 Note that early in the life cycle, tech companies have lower PEG ratios than non-tech companies and later in the life cycle, they look expensive. This is not a post on market timing, but there are lessons here for market timers as well. 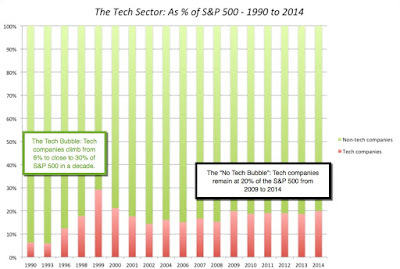 The composition of the S&P 500 has changed over time, with tech companies increasing as a proportion of the index from 6% of the index in 1990 to 20% of the index in 2015. While only the most successful of tech companies make it into the index, they do bring their specific life cycle characteristics with them. The effect on the index PE will depend in large part on where these companies are in their life cycles; if they are still in their growth phases, their presence will push up the index PE, but if they are in decline, they can depress the index PE. 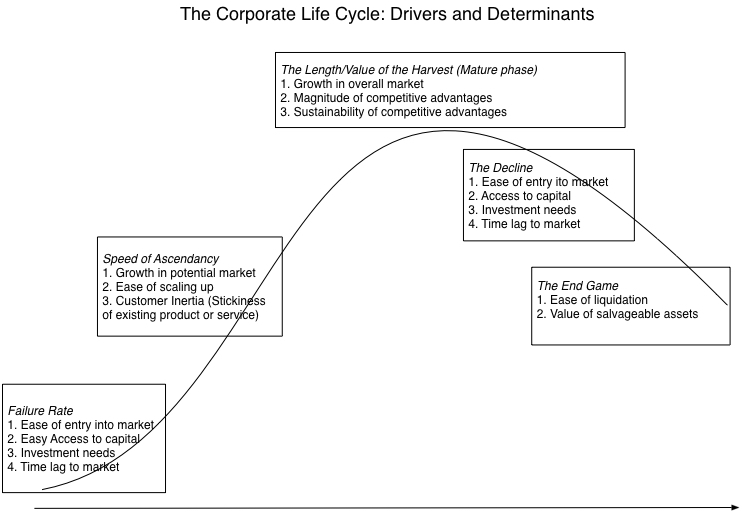 As someone who lives in the intrinsic value world, I wrestle with this compressed life cycle concept, when I value technology companies. The typical framework for valuing a company, in a discounted cash flow valuation, is to estimate cash flows for a growth phase and then to estimate a terminal value, based on growth forever beyond that point. Use a liquidation value, assuming that you disband the company and sell its assets. Since the assets of technology companies are not physical, this will yield a conservative estimate of value. Use a growing annuity equation, i.e., assume that your cash flows will continue after your terminal year but only for a finite period (10-15 years) and with limited growth. Use a growing perpetuity equation, with a negative growth rate in perpetuity, a practice that you don't see used often, but is well in line with what the model allows. Intuitively, you are assuming that the company will shrink over time and effectively disappear. As a final point, in intrinsic value, you have to make judgments about managers in companies, and when valuing declining tech companies, where managers are in denial about the decline, you have to value the consequences (bad investments, value destroying growth etc.). As the market's axis tilts towards technology, it may be time for us to revisit the metrics and models that we have been using, almost on auto pilot, for many decades. The shorter lives and the higher failure rates of technology companies can make them look cheap, when they are expensive, if you are a value investor, and their high growth rates can draw in growth investors, who may not factor in the fact that this growth is not sustainable. The Yahoo Chronicles! is this the end game? 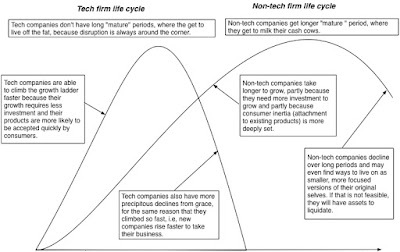 In my last two posts, I first looked at Yahoo, in the context of the challenges associated with turning around an aging technology company, and then argued in my second post that the life cycle of tech companies is compressed, relative to non-tech companies. As some of you have noted, there are not only exceptions to this rule, but there are actions, some healthy and some not, that managers of tech companies can, and often do, take to fight aging. The hyper speed at which their firms move through the life cycle can upend conventional rules on how to manage and finance businesses and there are three strategies that managers at these firms can adopt to survive and each has both a good and a dark side to it. In the healthy version of this strategy, as a tech firm (and its managers), you accept the fact that your life cycle will be short and you manage accordingly. 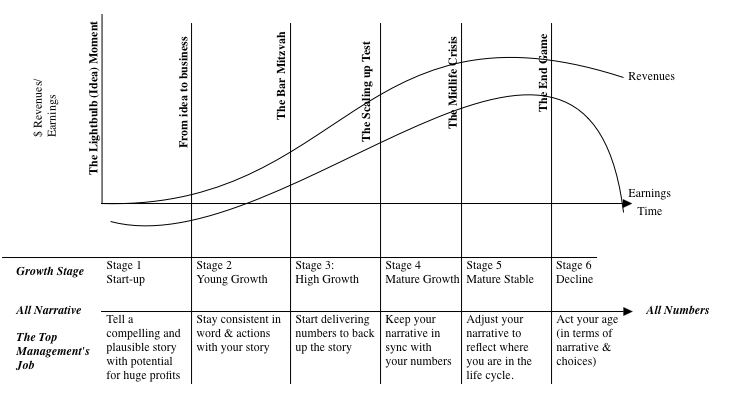 During your ascendance, its all about growth: Since your period of growth will be steep and short, you have to keep your focus on delivering that growth. You also cannot afford distractions, whether they come from fights over control or from having to make debt payments. When mature, use debt with restraint and keep it short term: The conventional wisdom is that mature companies should avail themselves fully of debt, and use its tax advantages to augment value. The same advice is often doled out to technology firms, but they are exposed to far more danger from debt, since their mature phases may last only a few years, rather than decades. Thus, tech firms will be better served if they borrow less than non-tech companies and keep that debt short term. In decline, return cash with a vengeance: Your cash returns, whether in the form of dividends or stock buybacks, should reflect the speed of your decline, and to those advisors who worry that you may be signaling to the market that you have no investments, remind them that it is never wrong to signal the truth. All of these suggestions, though, are built around accepting the speeded up tech life cycle as a fact of life and working within its constraints. In the unhealthy version of this strategy, you do nothing to alter the life cycle dynamics for the firm, but manage the firm, in denial, breaking one or more of the three rules listed above. During your growth phase, you allow yourself to diverted by fights over control or debt financing and lose a portion of your growth potential. As your firm matures, you either continue to act like a growth company, pursuing growth (at any cost), and/or borrow money like a non-tech company. In decline, you try to reverse the process by going after the corporate equivalents of tummy tucks and face lifts, corporate do-overs that do not change the end game but enrich others in the process. If you are the manager or owner of a tech company, it is natural to look for an anti-aging serum, something that will let you extend your life. After all, you do have the exceptions to the short life cycle rule, companies that have managed to not just survive over long periods, but continue to grow. This strategy is built on the premise that it is tech products that have short life cycles, not tech companies, and that if you can keep coming up with new tech products, you can extend your life as a company. Your management strategy, if you go with this option, will be to advance the company along two tracks. While nurturing your primary product, you will look for opportunities to extend what you see as your strengths (technology, design, user base), by offering new products and services. In your dream scenario, your initial success gives you a leg up for future successes, leading you to have an extended life cycle as a company. Promising though this option may look, there are two caveats and they are what characterize the darker version of the strategy. The first is that whether the strategy pays off for your stockholders will depend in large part on what you pay to extend your product portfolio. If the price you pay to add new products and extend your life cycle is greater than the benefits of doing so, you will have a long life cycle, but you will lose value along the way. The second is that the new products that you offer have to scale up, as you become larger. Put differently, a new product that adds fifty million in value is a giant step forward, when you are a hundred million dollar company, but makes only a small difference if you are a billion dollar company. An added and related implication is that the more successful your initial product is in delivering profits and value, the more difficult it becomes to find new products that make a substantial growth contribution. Increase the cost of entry: To accomplish this, you can look to legal protection (perhaps through patenting) or by creating gate keepers that slow and perhaps stop new entrants. In my view, both Microsoft and Apple have been helped in their life cycle lengthening efforts by controlling the operating systems that are the standards that competitors often have to follow to enter their respective businesses. Increase the cost of scaling up: To the extent that low capital intensity allows competitors to grow fast, you can work to increase the capital needed for growth. Increase the stickiness of customer preferences: If customers are quick to switch with technology products, you have to make it more costly to switch. This can be accomplished in many ways, by adding features to the product or service that become more user-customized with use (eg. search engines that remember your searches and online retailers that learn your preferences) or by creating work product that will be degraded or rendered useless by switching. As someone who has been frustrated with MS Office (for the Mac) at various times in the last few years, I have considered switching to competitors (Keynote and Pages, for instance) but have held back because I have thousands of Office documents from close to three decades that may or may not survive the switch. In the darker version of this strategy, the roadblocks you create to competition may expose you not only to bad public relations (as a bully or unfair competitor) but to legal jeopardy, as anti-trust regulators target and try to change your practices. Google and Microsoft, two companies that have adopted this strategy with extraordinary success over the last two decades, have faced this backlash, as a consequence of their success. 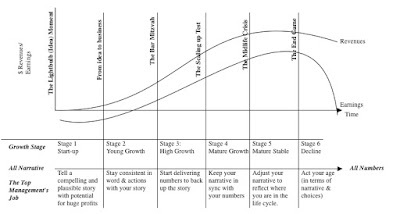 The corporate life cycle structure comes with a subtext on what type of management skills are needed at each stage. Put briefly, the "right" CEO for a company in the growth phase will need vision, charisma and story telling skills to attract employees, investors and customers to the company. As growth levels off, you need a different set of skills in your CEO, more discipline in seeking out growth and recognizing its limits. In decline, you want a CEO with limited ambitions, who is swilling to shrink the company and sell its assets, at the right price. While this is true for all companies, the process is easier for non-tech companies with long life cycles, where each phases lasts long enough to allow the process to happen naturally (where the CEO ages with the company and hands the reins over to a new one). Denial is more deep set: The potential for value destruction from going for growth, when it no longer makes sense to do so, is greater at tech companies than an at non-tech companies, because the management in place is often the same one that nurtured the company through its high growth phase. The problem gets worse if the CEO happens to be the founder of the company and views its decline and failure in personal terms. Making the backlash stronger: The natural reaction to management denial is investor anger which will be manifested in activist investors pushing managers to change, and if they refuse, push them out. Which is reason to worry about voting rights: In the last decade, technology companies have moved away from the "one share, one vote" paradigm that governed US companies for decades. That trend, started by Google, but extended by the social media companies, has been ignored as these companies grow rapidly but will become an issue for investors, when growth slows at these companies and the founders/insiders go into denial model. If you are a stockholder in one of these young tech companies with unequal voting rights, you will regret your inability to have a say in how these companies are run, sooner rather than later. Aging in Dog Years? The Short, Glorious Life of a Successful Tech Company! The corporate aging theme is one that I have returned to repeatedly in my posts, and I have looked at how the aging process creates dysfunctional responses on the parts of managers, who want to find ways to reverse it, and investors, who make bets on such reversals. 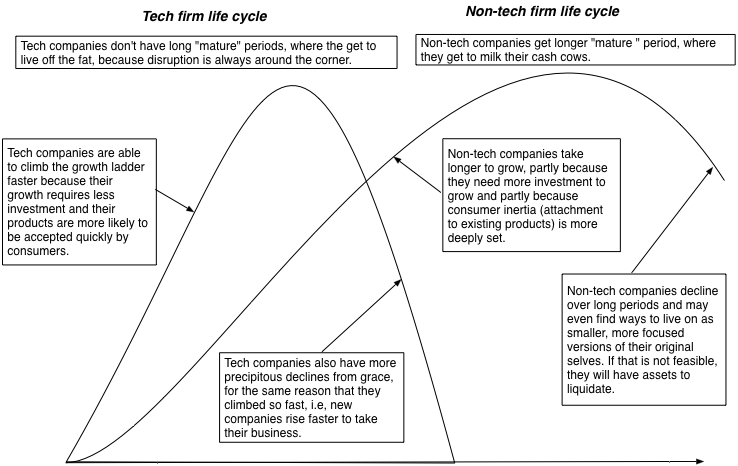 It was the under pinning for my last post on Yahoo, and in that post, I argued that technology companies have compressed life cycles, i.e., age in dog years, relative to non-tech companies. In this post, I would like to provide a rationale for why this may be the case and set the stage for my next post on what the implications are for managers and investors. 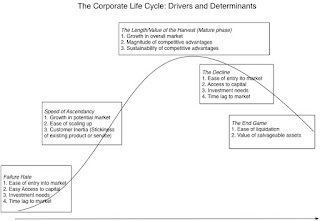 The corporate life cycle follows a familiar pattern. It begins with an idea, that develops into a product, which evolves into an operating business, that matures, and eventually dies. I have also highlighted the transitions that determine whether a company moves to the next stage and the mortality rate especially early in the life cycle is high. There are wide differences across companies in how long they take to climb the life cycle, how much time they spend as mature companies and how quickly they decline. As legal entities, corporations do have a little more give in the process, i.e., the capacity to slow or even reverse the process for periods, than individuals do, but not as much as they (and their strategic advisors) think that they do. The one reality that I think is incontestable is that even the most exceptional companies will age and that whether they deal with that aging gracefully is what determines how their stockholders will do during the process. When you start up, your focus is survival, and that will depend on (a) how much access you have to capital, (b) how much you need to invest to enter the market and (c) the time lag before you have a product or a service. Your chances of survival improve, if you have access to more capital and don't have to wait very long before you have a functioning product. The speed of your growth will depend on (a) how quickly the overall market is growing, (b) the ease of scaling up your operating and (c) how much inertia there is on the customers side. You will be able to grow faster, if the overall market is growing exponentially, scaling up is easy and you are dealing with customers who are willing to switch from incumbent products/services. The length of the mature phase will depend upon the nature of your competitive advantages, how big they are and how long they last. 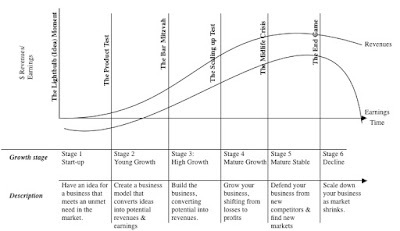 If your competitive advantages are strong and sustainable, your mature phase can last for a long time. Consumer product companies with strong brand names, one of the strongest and most sustainable competitive advantages, have longer mature phases than companies that have a cost advantage, a more transient and short term competitive advantage. 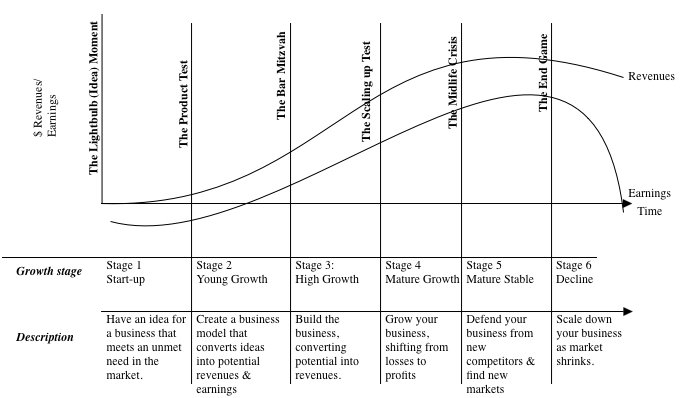 In decline, the speed with which your business will deplete will depend upon (a) how quickly new companies can enter the market (b) how quickly they can scale up and how willing customers are to try new products. In other words, you see that a mirror image of the qualities that allow for speedy growth also contribute to a quick decline. In the end game, your choices depend on what your remaining assets look like and whether they can be liquidated, without substantial losses. If they can, your end will be speedy and perhaps even painless. If not, your death throes can be long and painful. Before we start on a discussion of how tech companies are different from non-tech companies, we have to think about what separates the two groups, and that separation becomes hazier by the day. In the 1980s, at the start of the tech revolution, the distinction was a simple one. If a company’s products or services were computer-related (either personal or business computers), it was classified as a technology firm. That distinction allowed us to identify Microsoft, Apple and Atari as technology firms, and bring in HP, IBM and Digital Equipment as the old guard. That definition no longer works, as almost every product we buy (from appliances to automobiles) has a computerized component to it, and it has meant that deciding whether a company is a tech company is a judgment call. Given that reality, I would propose that rather than draw hard lines of distinction between tech and non-tech, we consider technology on a continuum, where at one end you have companies whose products and services are entirely technology driven (Google, Facebook) and at the other, you have companies that almost no technology component to them (consumer products and cosmetics companies, for instance). With this continuum, you can argue that Tesla and Ford are both auto companies, but that Tesla has a larger technology component than Ford. Why do we care about these distinctions? First, they have practical implications for analysts and portfolio managers. Sell-side equity research analysts are usually put into sector silos and asked to keep their focus on the companies that they are assigned. With companies like Amazon, Netflix and Tesla, high profile names to follow, I have noticed that there are big differences across banks. Some assign these companies to the technology analysts, some to the businesses that these companies operate in (Tesla in autos, Netflix in entertainment and Amazon in retail) and some create new sector groupings just for these gray area companies. Second, for better or worse, the categorization of a company can affect its pricing. Tesla, classified as an auto company, will look expensive, compared to other auto companies, but classified as a young tech company, it may look cheap. That is perhaps why companies seek out the tech label for themselves, even if technology is only a small component of their offerings. Scaling up is easy: Tech companies often operate in businesses where entry is not restricted, the up front investment is minimal and scaling up in easy. If market conditions are favorable, they are aided and abetted by access to capital and by less sticky customer preferences in their markets. 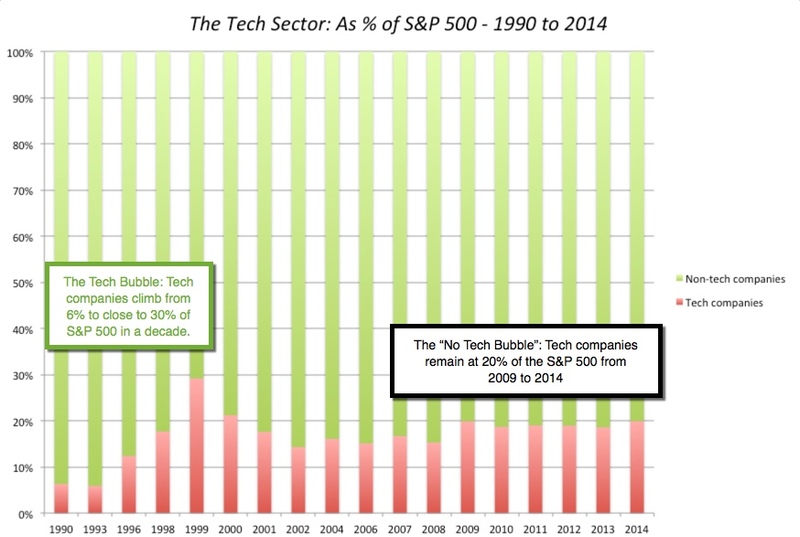 Not surprisingly, tech companies can grow quickly. Holding on is tough: Once tech companies reach the mature phase, they don't get to have long harvest periods. Their competitive advantages are fleeting and quickly deplete. Decline is rapid: The same forces that allow technology companies to grow, i.e., unrestricted entry, ease of scaling up and customer switching, also make them vulnerable to new entrants seeking to take their business away from them. And there is little left in the end game: Unlike other businesses, which accumulate physical assets as they grow and thus have a liquidation potential, with technology companies, there is little of substance to fall back, once earnings power is exhausted. Here, for instance, is my contrast between the life cycle of the typical tech company, contrasted with a typical tech company. Is there evidence that this is what happens in the market? I could use Blackberry as an example, but I would then be guilty of using anecdotal evidence to advance my theory. Instead, I will argue that the evidence exists, albeit in scattered form. First, there is evidence that the small tech firms (that survive the first tests) are able to scale up faster in terms of revenue growth (at least) than small non-tech firms. The fact that they often lose money while doing so is as much a function of the accounting inconsistency of treating research and product development costs as operating expenses, as it a function of operating weakness. The second is that these tech firms, once established, have a more difficult time maintaining growth. The third is that decline, once it starts at tech firms, is more difficult to reverse and quicker to accelerate. All of these points are made in this McKinsey article on growth at tech companies. Disruption is the new buzz word in corporate strategy, a reason that I listed it as on my list of words that operate as weapons of mass distraction, and is often used to cut off debate or not talk specifics. From my perspective, the essence of disruption is a that it is a new way of doing business that radically changes the fundamentals of on established business. In the context of technology-driven disruption, it a company, with a tech model, coming into a non-tech business, characterized by long growth periods, extended mature phases and elongated declines. Consider car service, i.e., the taxi cab and limo business. The old non-tech model for this business required regulatory approval (making entry difficult) and substantial investment (in cars) in a market governed by customer inertia. Uber and the other ride sharing companies have upended the model by bypassing regulatory approval, not investing in cars and breaking through inertia by reaching out to customers through their smart phones. The results speak for themselves. Not only have Uber, Lyft and Didi Kuaidi grown at rates unlike any seen by traditional car service companies, but each has a market reach that is beyond the old model. No traditional cab company can afford to operate in 300 cities, like Uber does. The effect of disruption is that it upends the fortunes of mature companies from the old business model, coasting in their mature phase, convinced that change is slow. Unprepared for the speed of change emanating from the tech entrants, these old players wait too long to respond, looking to regulators and rule makers for protection, and not surprisingly, face an implosion. That, in a nutshell, is what has happened to the taxi cab and limo business in many cities. The new entrants, though, should not celebrate too quickly, since their tech model disruption comes with its dangers. Their models are difficult to mine for cash flows and are themselves susceptible to competition. As I noted in my post on the future of the ride sharing business, disruption is easy, but making money on disruption is hard. The Yahoo! Chronicles! Is this the End Game? The big news of the day from the tech world comes from Yahoo (I am going to skip the exclamation point through the entire story, but don't read significance into that exclusion), where stories suggest that the board of directors may soon decide whether to sell its operating business, leaving it as a shell company with holdings in two other public companies, Yahoo Japan and Alibaba. The story has resonance for many reasons. One is the presence, as is required in any good story, of a villain, a role that is usually assigned to an activist investor and in this case ably filled by Starboard Value, a fund that has been pushing for this divestiture. The second is the existence of a heroine, albeit a tarnished one, in the form of Marissa Mayer, who was supposed to save the company by boldly moving where Yahoo had not gone before. The third seems to be an almost existential question of whether the potential end game for Yahoo, a company that many journalists grew up with as part of the technology landscape, is an indication of their own aging. Not only had Yahoo decisively and permanently lost the search engine fight to Google, but it was a company in search of a mission, with no clear sense of where its future lay. 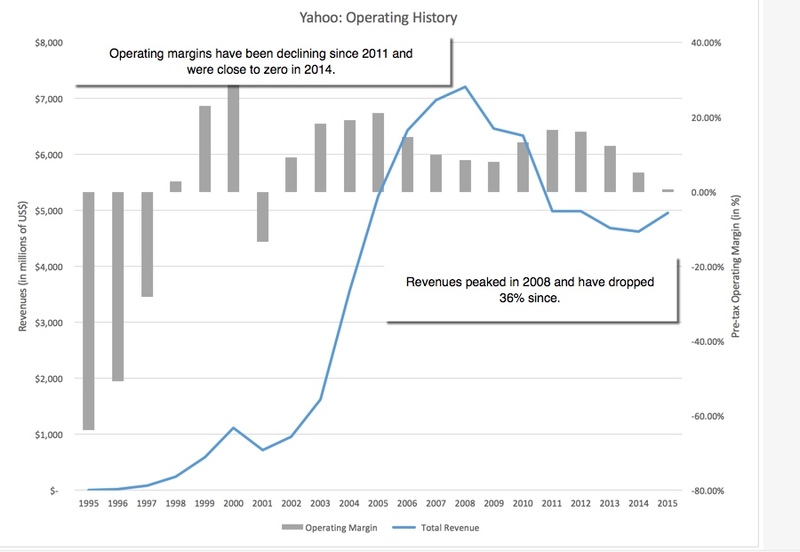 Note that of my estimated value of my total estimated value of $46 billion for the company, less than 10% (about $3.6 billion) comes from Yahoo's operating assets. The challenge that Ms. Mayer took on was to not only turn around a company that had lost its way in terms of its core business but one that derived most of its value from holdings in two companies that she had no control over. Her history of success at Google and the fact that she was young, attractive and female all played a role in some choosing her as the anointed one, the savior of Yahoo. It is hard enough to turn around a company but it becomes even harder when you are given control of only the rump of the company. The reality is that, on any given day, the value of Yahoo as a company was more influenced by what Jack Ma did that day at Alibaba, than what Ms. Mayer did at Yahoo. Lest I sound fatalistic, it is true that there are counter-examples, aging tech companies that have rediscovered their youth, as evidenced by IBM's rebirth in 1992 and Apple's new start under Steve Jobs. Much as we would like to give Lou Gerstner and Steve Jobs credit for pulling off these miraculous feats, I believe that it was a confluence of events (many of out of the control of either man) that allowed both miracles to happen. The Lou Gerstner turnaround at IBM was aided and abetted by the the tech boom in the 1990s and as for Steve Jobs, the myth of the visionary CEO who could do no wrong has long since overtaken the reality. By promoting both turnarounds as purely CEO triumphs, we set ourselves up for the Yahoo scenario, where a new CEO (Marissa Meyer) is assumed to have the power to turn a company around but we are then disappointed in her failure to do so. I am less disappointed in Ms. Mayer than many others, since my expectations on what she could do at Yahoo! were much lower, right from the start. In a recent article in the New York Times, Farhad Manjoo, a writer that I enjoy reading and respect for his tech savvy, made a case that Ms. Mayer's failures can be traced to her lack of boldness at Yahoo, or as he put it, her unwillingness to bet the farm, an ill-suited choice of expressions in many ways, at least for this CEO, and this company. First, as the CEO of a publicly traded company, she would not have been betting her farm, but that of her stockholders. Second, if you buy into the notion of Yahoo the company, as a farm, it is difficult to bet the farm, when you are given control of only the farmhouse (Yahoo operating assets), as Ms. Mayer was with Yahoo, and the rest of the farm (Yahoo's holdings in Alibaba and Yahoo Japan) is off-limits to you.. Third, betting the farm also connotes seeking out of long odds, in the hope of a big payoff, entirely okay if you are a young start-up, with little to lose, but not so in the case of Yahoo. Mr. Manjoo is not alone in believing that Marissa Mayer's fault was that she did not make a bigger acquisition or larger investment in some new business (for the most part, unspecified). In fact, it is part of what I termed the Steve Jobs syndrome, where CEOs aspire to be the next Steve Jobs. While some go so far as to don black turtlenecks and strut on the stage like he did, most settle for wanting to be heroic enough during their tenure to have books written about them, and Ashton Kutcher play them on the screen. More dangerous is what follows, since to be like Steve Jobs, you have to make a small company into a really big one, and the way to do that is to take dangerous risks or to "bet the farm". The end results reflect the laws of probability, and the stockholders in these firms end up paying for a CEO's play for celebrity status. If you accept my thesis that many aging tech companies resemble the Walking Dead, you should also accept the follow-up proposition that what these companies need are not "visionary" CEOs but pragmatic ones, less Steve the visionary, and more Larry the Liquidator, a person with limited ambitions and a readiness to preside over the dismantling of an enterprise. Unfortunately, if you are such a CEO, and your life were made into a movie (odds of which are low), you will be played by Danny DeVito and not Ashton Kutcher, but there is always a price for doing the right thing. The debate about what Ms. Mayer should or could have done at Yahoo is a subtext to the other great debate about buybacks at US companies, and especially those at tech titans like IBM and Microsoft. Rather than wringing our hands at how these buybacks are leading to less investment at these companies, we should be relieved that these companies have moved past the denial phase and are dealing with the reality of aging. Rather than talk about Yahoo's businesses (their search engine, advertising), which will draw the attention of potential buyers to the operating statistics (which are a downer), talk about the number of Yahoo users (the billion that you have overall and the 250 million who use Yahoo Mail). Towards the end of my post on Yahoo from last year, I suggested that my returns on Yahoo would be inversely proportional to Ms. Mayer's ambitions and argued that my best case scenario would be one where she scaled the number of employees in the firm down to one (herself) and acquired two computer displays, one of which would deliver real time price quotes on Alibaba and the other the latest price of Yahoo Japan. 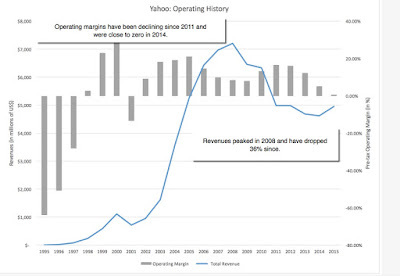 If the board acts to sell Yahoo's operating assets, we may be closer to that vision than I ever thought I would get. If this is the end game, I am thankful that, while Ms. Mayer did show flashes of ambition, as revealed in her acquisitions (with the Tumblr deal being the largest) over the last three years, she did not "bet the farm" on an outlandishly large acquisition or investment. Perhaps, I am giving her more credit than I should, and the only reason she showed restraint is because she could not find a tax advantaged way to get rid of Yahoo's investments in Yahoo Japan and Alibaba. If so, this may be one of the few times that I am thankful to the IRS for not allowing the transaction to go through, since on its completion, Yahoo would have ended up with $20 billion in cash, and I shudder to think of how much damage a "bet the farm" CEO could have done with that money.